AP EAMCET 2018 College wise Seat allotment results at apeamcet.nic.in and Download Allotment Order by Signing-In through 'Candidates Login'. AP EAMCET 2018 College Wise Allotment Results/Provisional Allotment List: The Andhra Pradesh State Council of Higher Education (APSCHE) has released the college-wise Seat allotment details for Engineering, Agriculture and Medical Common Entrance Test (EAMCET) 2018. Candidates who have appeared for and cleared the exam can check their results on the official website of the Council. AP EAMCET was held from April 22 to April 25, 2018 in two slots from 10 am to 1 pm and from 2.30 pm to 5.30 pm. The combined engineering and agriculture exam was held from April 22 to 25, 2018 and the agriculture entrance was conducted on April 28. The results for the same were declared on May 2. About exam: The examination is held for giving admissions to candidates to courses such as engineering, Bio-Technology, BTech (Diary Technology), BTech (Agr Engineering), BTech (Food Science and Technology), BSc (Ag), BSc (Hort), BVSc, AH, BFSc, B Pharmacy, Pharma D.
AP EAMCET 2018 seat allotment results to be announced today at apeamcet.nic.in: The Seat allotment results for Engineering, Agriculture and Medical Common Entrance Test (EAMCET) 2018 in Andhra Pradesh will be released today at apeamcet.nic.in. Candidates who have applied for the seats in engineering and medical colleges can view their seat allotment result today. The Andhra Pradesh State Council of Higher Education (AP SCHE) had conducted the entrance exam in April. As per a notification, certificate verification and exercising options were done for this phase. Candidates who will attend certificate verification first time have to pay processing fee online before he/she attends certificate verification. A total of Rs 1200 (OC/BC) processing fee has to be paid. For SC/ ST category, Rs 600 needs to be paid. 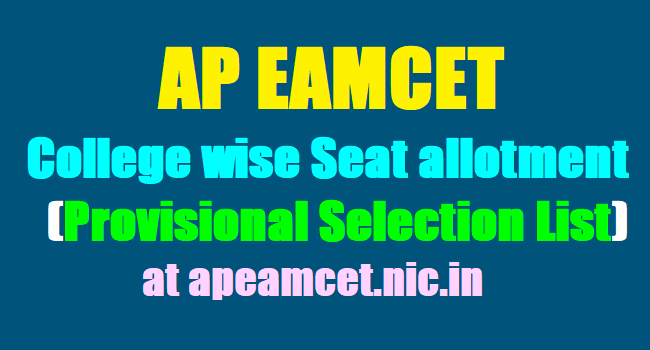 Step 1: Go to the official website for AP EAMCET (apeamcet.nic.in). Step 2: Click on the notification for “Final Allotment Details”. Step 3:Enter your preferred college name and branch in the fields provided. Step 5:Scroll down the list to check your name, rank and hall ticket number. Step 6:Download the page and take a print out for further reference.